This week President Barack Obama personally leads an attempt to persuade the US Congress to authorize a US militarily attack against the Syrian regime in response to a chemical weapons attack on rebel held areas in Damascus on August 21. Casualties range from 355 to 1729 dead, with three times as many being injured in the attack. Obama lays responsibility squarely at the regime of Bashar al-Assad. Obama claims intelligence sources confirm with ‘high confidence” that the attack was launched by the regime even if Assad did not give the order. This is reflected in a German Intelligence report that has just emerged that suggests that the attack was conducted by government forces without Assad’s approval. The tide of the war, however, changed dramatically for the Assad regime with an influx of Hezbollah fighters from Lebanon and Quds Force volunteers from Iran. Cities and territory that had been held by rebel forces for months began to fall starting with the border town of Qusayr in April 2013. So why would Assad resort now to the use of chemical weapons in Syria’s capital city? He most likely didn’t as some press reports are now claiming. Nor is it feasible that the rebels themselves would target a rebel held area thereby dealing themselves a significant tactical military setback. 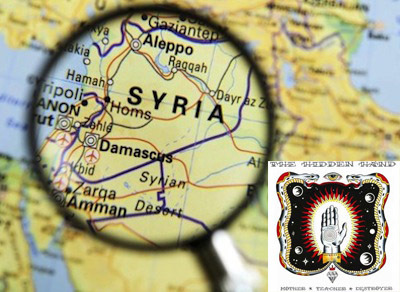 The most likely culprit is therefore a shadowy Third Force calling itself “The Family” that desires to escalate the conflict in Syria and fulfill its own prophesy that Damascus would become uninhabitable. The ultimate fate of Damascus will be a sign that the revelations of the Hidden Hand and Benjamin Fulford were accurate – the Earth has been controlled by a “Family” or “Criminal Cabal” of ruling bloodlines with enormous power behind the scenes that manipulates both sides in international conflicts. A book by William Bramley, the Gods of Eden, traces how the Third Force – he calls them “the custodians” – has historically manipulated both sides of conflicts to achieve its long term goals. Numerous witness reports suggest that most visiting extraterrestrials, however, are not part of the Third Force, and in fact are in conflict with them. According to multiple contactees and the Book of Enoch, the Third Force was a criminal band of extraterrestrials banished to Earth millennia ago. President Obama’s attempt to persuade the US Congress to authorize military force against Assad’s regime is facing heavy resistance and may fail. More people than ever have become educated by the alternative news media about false flag events, and strongly suspect that the chemical weapons attack in Ghouta, Damascus was indeed a false flag operation. It was not however an attack launched by the Assad regime or by the rebels who both had no clear interest in authorizing such an attack. Instead, ultimate responsibility lies with the Third Force which explicitly mentioned years ago that Damascus would in future suffer from calamitous events that would make it uninhabitable. We are very likely witnessing the beginning of a chain of events that may fulfill this dire prophesy. However, the power of the alternative media to educate the general public about false flag events and a historic extraterrestrial presence (exopolitics) is a positive development. It may culminate in the planned chain of destructive events in Damascus involving chemical weapons and U.S. intervention not occurring. There is good reason to believe that the power of the Third Force to manipulate humanity’s fate is being increasingly exposed, and will eventually come to an end.